No one wants to continue driving around with body damage to their Mini Cooper. If the problem is dents or dings, then you have two main repair options: take your car to a body shop or opt for paintless dent repair. Paintless dent repair is a simple process in which specialized hand tools are used to get behind the body panels of your Mini Cooper. Once behind the panels, our highly-trained technicians push, pull, and massage the panels to work out dents, dings, and creases. The finished product is dent repair that doesn’t require paint, chemicals, or body fillers. The three main reasons to choose paintless dent repair for your Mini Cooper are price, convenience, and time. Opting for paintless dent repair from EZ Dent saves you much more money than going to the body shop because our service has less overhead. Our technicians and processes focus solely on PDR. Our lean operations allow us to pass overhead savings on to you. The final reason to choose paintless dent repair is time. EZ Dent repairs most Mini Cooper dents, dings, and creases in an hour or two. You’ll be back on the road in no time at all, in a beautiful looking car, if you choose paintless dent repair. 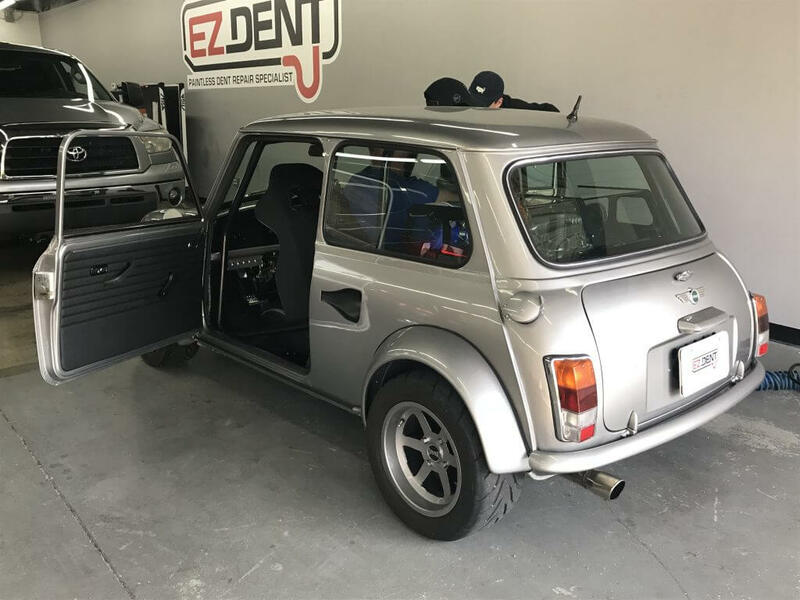 *Disclaimer – EZ Dent is not affiliated with Mini Cooper or authorized Mini Cooper dealerships. Serving Athens, Atlanta, and all of North Georgia, EZ Dent provides free quotes for Mini Cooper dent repair and removal.